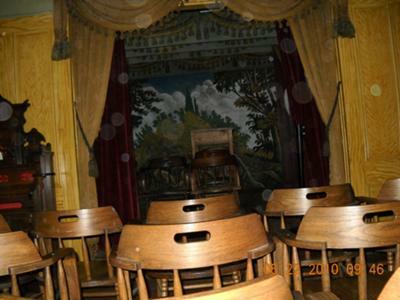 Hi here we are in the theater room on a private tour of the Whaley House. In this picture: since we could do anything we wanted in the house, we where sitting in this room relaxing, getting comfortable being in the House. We have many good pictures that I'll upload. This room felt like walking through heavy air. Also when we walked on the stage and went to the right, through a side entrance to the other room both the guide and myself noticed all the hairs were standing up on our arms and we were covered with goose bumps. If you come to the Whaley House for a tour I recommend the private tour, you won't be disappointed. Check out the other pictures I'm sending.